So I got this gem of a bag a few weeks ago already, but have not yet had the opportunity to bust it out. I had spotted it at Aldo, and was immediately attracted to it! 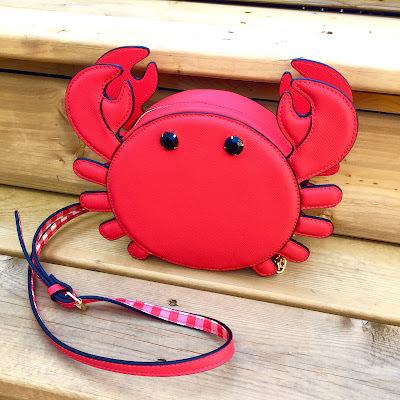 It's a bright red, circular crab purse! How could I not be in awe over it? I mean, have you seen those beady eyes and little legs? The gingham lining is just icing on the cake for me. 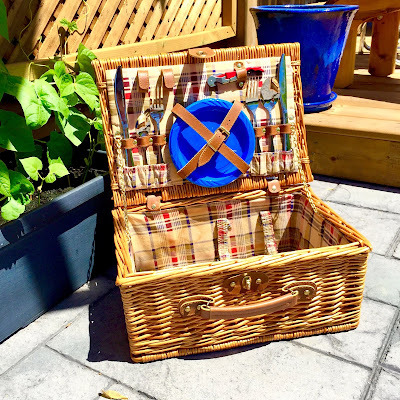 This purse is what every nautical style lover's dreams are made of! After I'd purchased it, I came across the Kate Spade versions which are just as cute! The shape is slightly different, but the price of the Aldo one was right for me! Bring on the next Disney live-action remake, I'm ready for it! A lifelong Disney fan, I am always looking forward to their newest ventures. I am particularly excited to see what Tim Burton makes of Dumbo. I love his approach to the creepy and bizarre, so this should be a good combination. I'm expecting it to be along the lines of Edward Scissorhands meets Water for Elephants. I could be way off here, but those are the vibes I'm getting. This definitely has potential! March 2019 can't come quick enough! Ok, this basket is a diamond in the rough for me. I'd always loved the idea of a traditional wicker picnic basket, but found them so pricey. A couple months ago, my partner dragged me (I was a teensy bit reluctant) into a thrift shop. He loves flea markets and the likes, so I indulged him. Well, I was in for a surprise as I spotted this beauty of a basket on a shelf. I opened it up and tested it out to check its condition and was pleasantly surprised to find out it was practically in mint shape. If that hadn't convinced me yet, the price tag sure did! It was only $1.50! I had to look twice because I couldn't believe my eyes! I got it for less than a cup of coffee! And to think I didn't want to go into the store in the first place. It paid off this time! Basket in hand, we headed straight to the dollar store to try and find dishes and cutlery to fit in our new (to us) picnic basket. We plan on using it when we go on day trips and boat rides. For now, it's on display in our living room. 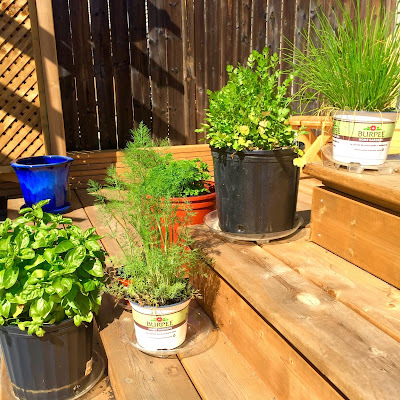 This year, my fiancé decided to start a little herb garden (among other plants). He decided to keep each herb in its separate pot as a way to contain them. We have basil, thyme, dill, chives and cilantro. He even arranged them all along the steps of our deck. It looks really cute and is super practical. He's an avid cook and does not miss an opportunity to go outside and snip off a handful of fresh herbs to add to whatever dish he is making. It's the small things in life! The best ever award show (according to your truly) played last weekend! I love watching the Tony's and I find it to be the most entertaining of the award shows. I've always been a huge musical theatre fan and look forward to seeing the performances! This year's standout for me was the tap chorus line with Squidward, from the new SpongeBob Squarepants musical. I actually had no idea they made a SpongeBob musical and have to admit I was a little skeptical, but seeing this number has totally gotten me on board with the show! It was the most creative and whimsical thing I've seen in a long time! Besides that discovery, I have to say a little something about this year's hosts. Josh Groban and Sara Bareilles were awesome! They were funny, entertaining and performed awesome opening and closing songs. I'd say this year's show hit all the right notes!